Map of the summer 2013 cruise. The University of Washington research vessel Thomas G. Thompson is loading up for six weeks at sea. When the team returns to Seattle in late August they will have extended the cabling to key research sites, an important part of building the first real-time, continuous eye on the mysterious creatures, currents and geologic forms in waters off the Pacific Northwest coast. The UW is leading a $239 million project funded by the National Science Foundation to install a network bringing data directly from the deep sea. Just as robotic rovers on Mars now keep a digital eye on the Red Planet, a suite of electronic tools will soon send photos, observations and high-definition video of an alien environment just off our shores. Members of the public can accompany the team through daily blog posts, images and video the team will share through Aug. 23 on its expedition website. 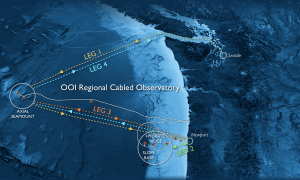 The cabled observatory, known as the Regional Scale Nodes project, is part of the national Ocean Observatories Initiative, an effort to integrate U.S. measurements of the ocean and seafloor and educate the public about the ocean environment. While space vehicles can generate energy from the sun and send data wirelessly through space, neither is possible in the deep ocean. This summer the UW-led team will lay another 14 miles of cable, bringing power and fiber-optic communication at study sites on the seafloor. The new lines will extend from the main cables to sites with earthquake activity, volcanism and biological productivity that scientists want to investigate. Two summers ago, the UW team helped telecommunications contractors to lay the backbone cable, which carries 10,000 volts needed to transmit power over long distances and transmits up to 240 gigabits of data per second. Those stiff cables were laid in relatively straight paths off the side of telecommunications industry ships. Now the UW vessel will use a remotely operated vehicle to lay medium-powered extension cords from the backbone to the scientifically interesting – and by definition hazardous – study sites. The initial part of the expedition is a short trip to the underwater volcano at Axial Seamount to check on hardware installed last summer. The ship will then leave Newport, Ore., to work on a 200-mile horseshoe-shaped cable off Oregon’s coast, where the Juan de Fuca plate dives under the continental plate to create the Pacific Northwest’s number-one earthquake threat. As well as one day monitoring seismic activity, researchers at the UW and Oregon State University will track currents bringing nutrients from the deep ocean up to the continental shelf, an important region for fisheries and site of a recurring low-oxygen dead zone. An underwater robot with a specialized apparatus to lay cable will unroll spools that are as tall as a person and weigh as much as 6,000 pounds. The robot flies at less than 2 feet per second to carefully spool out the cables, which measure from a third of a mile to 3 miles long. Since researchers can’t see the seafloor, roughly 75 feet below the robot, they will track progress using the ship’s position and marks on the cable. After each section is laid the robot retraces the route to inspect the cable and, if necessary, lay mats underneath to protect against abrasion over rough terrain. During this leg the team will also survey a nearby ridge seeping with methane hydrates, a potential energy source, and make preparations for more work there next summer. In mid-July the team will again dock in Newport, Ore., reload the ship and follow a cable that spans the Juan de Fuca tectonic plate to its western edge at Axial Seamount, an underwater volcano 300 miles offshore. The team will lay three cables that run directly across the volcano’s caldera. One carries 10 gigabits of data per second, 10 times the transmission in other cables, needed for the high-definition video camera. At the underwater volcanic ridge scientists will study the planet’s most common source of volcanic activity and try to better understand the fundamental forces that drive plate tectonics. Once video equipment is installed, scientists and the public hope to get their first chance to see an underwater volcano erupt in real time. The final leg will take place at two hydrothermal vent fields near Axial Seamount. At this site scientists will capture information about the black smokers and white snowblowers, as well as the dense clusters of tube worms and microscopic animals that gather around the geologically active sites, which may harbor Earth’s oldest life forms. This is one of the trickiest sections to lay cable as the terrain is rough and the vents spew liquid at up to 700 degrees Fahrenheit. Researchers have mapped the cable paths to within a few feet precision. “You don’t want to make these calculations on the fly, with your robot suspended in the water column above some rough terrain,” said project scientist Giora Proskurowski, who will be co-chief scientist on the third leg. The robot has a UW-designed piece to allow cable testing. So it’s possible that this summer’s work will involve lifting the flexible, oil-filled ends of the cable, removing their casings and plugging them in to allow testing from the ship more than a mile overhead. A half-dozen students will be aboard each leg, along with engineers at the UW Applied Physics Laboratory who worked with scientists to design and build the observatory components. After the infrastructure is fully installed and tested, the cables will connect and instruments – ranging from seismometers to high-definition video cameras and machines for DNA analysis – will be installed next summer. The cabled observatory will be fully complete and commissioned in early 2015, and data is expected to flow from it for at least 25 years. “It really is a historic moment for oceanography,” said Deborah Kelley, a UW professor of oceanography who will be co-chief scientist on three legs. Kelley, an expert on hydrothermal vents, said she looks forward to real-time data that will help to understand the links between seismic activity, volcanoes and deep-sea life forms. “I don’t think oceanography will ever be the same, in the kinds of questions we can ask, and the ways we can answer them,” she said.